Pros: The ability for those from the social sciences to be able to import and/or retrieve social media data, including historical data from Twitter, and analyse the data in order to answer research questions. This is because other tools may require a computer science background. Consequently, DiscoverText has been used in answering important social science questions leading to peer reviewed outputs. Over the years I have seen many tools appear and slowly wither away, however, DiscoverText has stood the test of time and has been growing in popularity. DiscoverText is not limited to academic uses and has a number of neat uses in the commercial world. A useful feature applicable to the commercial domain is the ability to retrieve and/or import data from Twitter and identify influential Twitter users, with the additional ability to use machine learning to sift influential users into different groups. 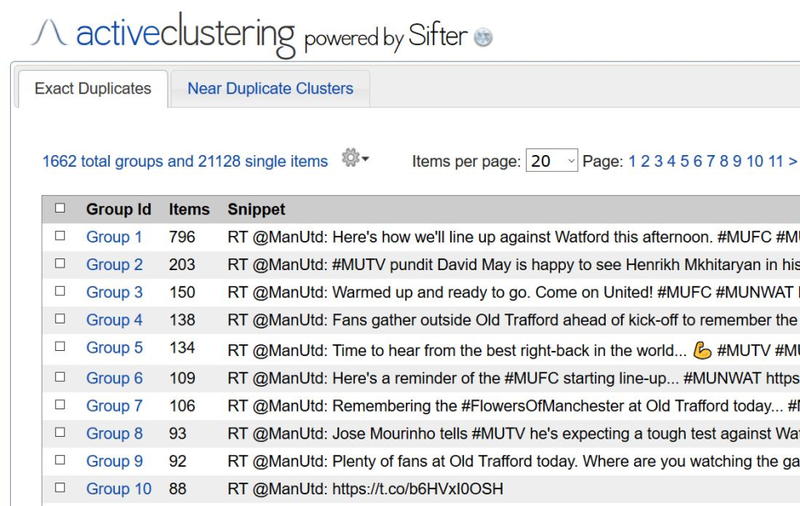 For example, a football club may be interested to find out whether influential users are fans of the club or whether it is opposition fans causing a storm. To the best of my knowledge, no other tool is capable of doing this with this level of accuracy. Cons: To be fair this is not a limitation of DiscoverText per se, as this is a restriction from Twitter, but there is a limit to how many units of tweets can be exported per day. This is not a major issue because there are enough features in DiscoverText that you may not necessarily need to export the data. This is particularly true with a recent integration with NodeXL which provides the ability to export directly to a format supported by NodeXL. Overall: It allowed me to conduct research that otherwise would not have been possible including both industry and academic projects. Pros: DiscoverText is a great tool for collecting, sorting, and analyzing data. The platform allows for collection of data from various networks, such as Twitter. I mainly use the platform for coding and machine-classification of tweets. The import feature allows for integration between DiscoverText and other interfaces. For a client project, our data was collected from another toolkit and formatted in an Excel CSV. We were able to import the data into DiscoverText and use the platform to code and machine-classify the tweets. 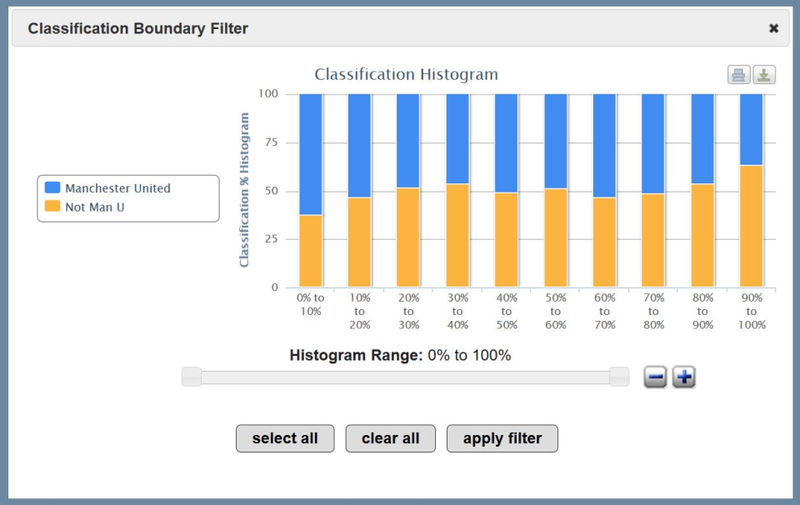 When working with multiple coders, the platform enables you to quickly and efficiently measure inter-coder reliability, which is helpful to determine validity of codes and which categories may need re-classification. I also like the export feature, which allows you to export coding/classification reports. The platform produces different visualizations (e.g. pie charts/graphs) of the coding breakdown, or you can export the entire report into another file (such as a CSV). Overall, I've had a great experience using DiscoverText for both in-class and client research projects. I will continue to use the platform for future research projects, especially the coding and machine-classification functionalities! Cons: When first using the software, it could be a little difficult for a beginning user to identify where all of the features are located and their specific purpose (e.g. exporting reports, buckets, duplicating a dataset). However, the training sessions, video tutorials, and manuals are very insightful and can help immensely with learning of the new features. As with any new platform, it just takes a bit of time to learn all of the features! A perfect tool to explore, collect, search, store, manage, code and classify the Twitter universe. Pros: As a social scientist, I lack the computational skills to work with Twitter data. In fact, Im not interested in doing data science, I want to do social science. 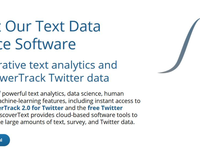 DiscoverText allows me to collect and analyze large batches of Twitter data. Many of my colleagues spend hours having students copy and paste tweets into the Excel. DiscoverText is a breeze. Cons: There are a number of different classification algorithms like linear or logistic regression, decision tree, SVM, and random forest. DiscoverText just uses naive bayes. I wish the software allowed for more different types of these algorithms. Overall: The ability to work with Twitter data. So, I promise it will happen some day. For now, the uClassify engine that we license is working great on all languages and in all sorts of projects. Pros: - The software allows to code and machine-classify thousands of tweets per day through its filtering, search and other advanced features. - The fact that is cloud-based makes it very convenient to work collaboratively with very large amounts of data from anywhere. 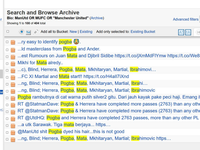 - The metadata and tag cloud features are very useful throughout the whole coding and analysis processes. Customer support is great and normally very timely. Cons: The software has many extremely useful features, but sometimes it has been hard to keep track of exactly how to use them and where to find them, especially because they are constantly evolving as the developers improve existing features, and add new features and functionalities. It would be helpful to have online User Manual that contains the exact way to use function, what each function does, and how to access them easily. Overall: We are an academic institution using Discovertext to study social media use related to disaster preparedness and response. We've used the platform to code, filter, classify and analyze historical Twitter data (about 1.5 million tweets), which has opened new opportunities in academic research of social media use. We have used collaborative coding processes and individual coding, the combination of which makes this platform a unique tool for data analysis. We hope it continues to exist and improve as it provides a great service for research like ours. Pros: First, it is so easy to learn and use. Moreover, the DiscoverText founders provided some helpful tutorials and educational videos which are so handy and helpful. This software allows users to makes several datasets of one project. This enables a researcher to work on multi-dimentions of a certain project needless to create different ones. Furthermore, you can create a sample of your data very easily by making a dataset. Its buckets are very interesting also. Additionally, you can make some clouds of data by using cloud explorer feature. 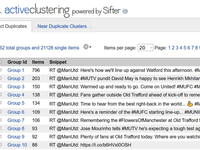 Finally, Clustering option is great! it makes working on big data easy and shows the main trends in them quickly. Cons: As I can say, sometimes users may get confused by many links and pages. So, maybe finding what you want becomes difficult and you have to try some ways. Another con, in my point of view, is the obscurity of metadata meanings and algorithms. I cannot understand what some of the means and how they are calculated. Furthermore, I think some of metadata can be presented in some more useful ways. But at all, I should confess the metadata explorer is a great ability! Overall: It provides me more opportunities for working on my projects. Using it, I have access to many ways for doing research on social media data which have not before. Thanks Hossein for an excellent review. We are preparing a new blog post now with a Metadata Dictionary for Gnip Twitter data. We agree that some of the fields are a bit confusing and we hope this new blog post will make the meaning of some of the fields more transparent. We have been using the software to study twitter conversations on immigration going back to 2013. Pros: It's ability to capture tweets and now the capacity to export to NodeXL gives us two tools that we use together to study the content and structure of immigration conversations onTwitter. Cons: At times navigating the menus is counter-intuitive as is some of the terminology. Archives, buckets, datasets all kind of run into one another. Thanks for your and the generosity of your Tweets. We really appreciate that! I'd like the opportunity to visit GMU to make the case that archives, buckets, and datasets are essential parts of the text analytics methods we have engineered. Please email info@texifter.com if you would like to host a free workshop. - Archives are raw data. - Buckets are subsets of raw data. - Datasets are coded by humans. The key point is that raw data is messy in the archives, cleaner in buckets, and fully refined and classified in datasets. Pros: Well again, DiscoverText is really intuitive to use, I did read and look at some videos before using it but it wasn't necessary. I have used other qualitative analysis software and although they were a little different, I would say that DiscoverText is the easiest to get familiar with, just set up your themes, categories and start coding. Also something to consider in my opinion is the ease to navigate through the website, not overly complicated, nice blue/gray theme that won't feel heavy after hours spent on the PC. Cons: Only one maybe, if there are a few coders coding at the same time the same project the software can become a little slower. Overall: Quick way to collect and analyse data, also very mobile phones and tablets friendly. Thanks for this delightful take on the interface. Reading reviews, it is often the case that users underestimate what it might take to overhaul the front end. We would like to, but a bigger company tried in 2013, spent $1M, then gave up, so for now we tinker at the edges to make the experience usable. I think you are absolutely on target about our goal not to overcomplicate coding (labeling, tagging, or annotation to some). Out first open source tool was devoted to recording observations about text with minimal interaction with a mouse (hence the keystroke coding). Since then, many layers of functionality have emerged, but at teh core, it is the interface for displaying text/Tweets, the auto-loading of items to be coded, and the project management/measurement features, that are the kernel of our success. 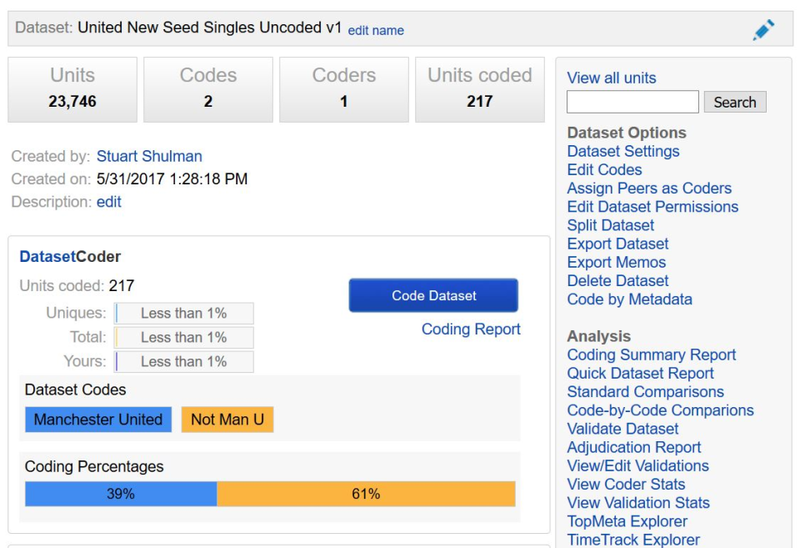 DiscoverText is unique--it has the best mix of human coding and machine learning I have found. Pros: The dashboard allows our lab group to see multiple projects at once and keep track of the data feeds so we know how quickly we are collecting data on particular topics. It also has many useful functions like tracking topics over time, data cleaning support, analyzing social media meta-data and exporting data into other tools like NodeXL. Cons: Most everything is pretty intuitive and support is very fast. My biggest challenge was setting up hierarchical coding schemes, which can be challenging until you create a template that can be reused. Overall: Combines data collection, human coding, machine coding and then easily exports to other software packages for additional analysis. Saves a huge amount of time. Thanks for the feedback. We really appreciate it. Pros: Working as an independent consultant, I have had opportunities to help some clients analyze textual data through coding exercises. The first exercise was to examine customer feedback that had been collected by a weel-known hotel/travel review site. The customer's feedback data was tallied and processed with spreadseets, which was very cumbersome because quite a bit of horizontal scrolling across the spreadsheet's columns was required to enter customer's sentiments about the hotel. After becoming familiar with DiscoverText, I estimated that the same exercise could probably have been accomplished in half the time. Coding can be designed so that the coders simply have to select a number (e.g., 1 through 5) or from a list of predefined sentiments (e.g., staff was friendly, the hotel was clean, elevator did not work, etc.). More recently I have used DiscoverText on several projects, including attendee's comments about a local music festival, an employee satisfaction survey, and tweets about a clothing and accessories brand. Cons: The interface takes a little getting used to. I suggest you practice with a small sample dataset before launching into a huge research project. Overall: Can remove duplicate to reduce the time it takes to code a dataset. Can supply your own data, such as from a survey, in various formats including text and Excel spreadsheet. Can acquire data from social media including Facebook, Twitter, and others. Pros: DiscoverTest (DT) is great at what it was intended to be used for. DT makes it easy to schedule fetches from leading social media and information websites, and allows the user to specifically get the data they are looking for. We have used DT for 2 different projects so far and it seems to work great for our team of analysts. Cons: DiscoverTest has a relatively steep learning curve, and therefore can be intimidating to new users. It is well worth your time though, as the features far outweigh the learning curve. DiscoverTest has a relatively steep learning curve, and therefore can be intimidating to new users. It is well worth your time though, as the features far outweigh the learning curve. Thank you for your review. DiscoverText is indeed a powerful tool, and therefore does take some time to learn all of its features. We try to make this easier with our training resources. We offer web demo meetings, video tutorials, and a knowledge base full of documentation that we hope you find insightful and helpful when learning the features of DiscoverText and Sifter. I've been using it for several years for analyzing customer data and Twitter data. Pros: My favorite feature about this software is the fact that it allows multiple coders to easily work on a coding project. So if you have a lot of data, you can load the data on DiscoverText, set up some codes, and have several people work at the same time with coding. It will provide you with a report of what each coder did for how long etc, and also will allow you to export the results. You can also import data directly from Twitter using the search API. Coders can see the actual tweet when coding, which helps speed up the coding process. You can also export the data to NodeXL in order to generate social graph and calculate social network analysis metrics. For a fee, it is also possible to get access to GNIP and the entire historical archive of tweets. DiscoverText is not limited to Twitter, you can import data from other sources (including SurveyMonkey). As a researcher working with Twitter, for me the most valuable tool is the ability to easily create and code a Twitter dataset. Cons: Sometimes it will let two coders work on the same item if they access the item at the same time. Not allowing this could speed up the process. Overall: It's easy to create and code a dataset, and it is a particularly useful software to work with a team of coders in the same dataset. Our goal was to get a historical tweets and do an linguistic analysis. Thanks for taking the time to write a review. It contains some good ideas, some of which we might be able to act on, but others are beyond our control. The regulation of Twitter exports, for example, is set by the Terms of Service of Twitter. We are specifically barred, as are all vendors, from setting up a command line API to facilitate the process. The save as CSV is a very strict guideline and engineering what you want would result in Texifter losing access to Twitter data. So, it is a "con" of working with Twitter data, not DiscoverText. I'd like to hear more about why you need to store links to more than 15 exports simultaneously. Since you can only create 1/day of 50,000 Tweets, and the purpose is to export it, not store the CSV link in a list inside DiscoverText, why would you need a list of more than 15 links to files? Presumably you have already exported. I have the same question with the duration. Once the data is downloaded, why must the link endure? It's a great tool to code big or even vast amounts of data in an efficient way. It work very well! Pros: It is easy to use, very intuitive, it gives you the basic options and functions in a clear design. Through the annotation tool, it is easy to amend the existing coding scheme and hint to anything problematic. This way you can also easily communicate with other users who you work on a project with. I really like the elegance of the program! It works very well for both rather simple (even binary) and truly elaborate and detailed coding schemes. Cons: the only real problem I encountered was that it can be annoying to jump back to an already coded item (for instance if you realized you made a mistake or want to add an annotation): if you use the "back" function it brings you to the previous numerical item which might not be the one you coded but one someone else is coding at the same time. Then you have to keep clicking "back" until your item reappears. This should be fixed. It is, however, a rare issue. Thanks for this idea and the generous review. It makes perfect sense and we will engineer a solution for that immediately. 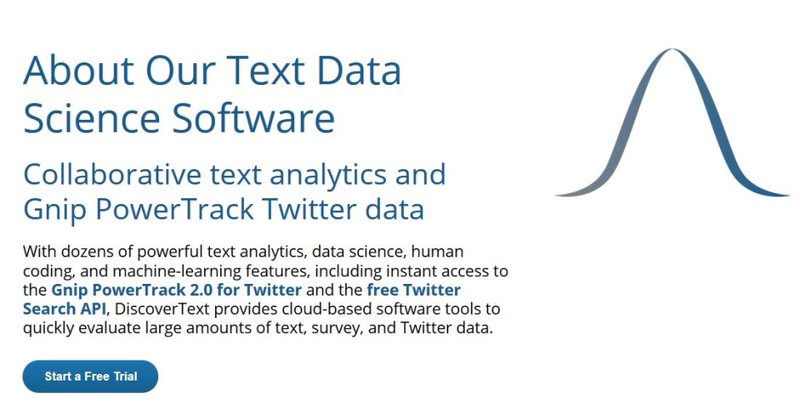 Pros: Discovertext has enabled me, a non-IT specialist, to create, sort and purchase large scale twitter data sets for qualitative academic research. As a platform it is extremely user friendly and intuitive and took very little time for me to become comfortable with. It is also always accessible, I have logged in all over the world and have never had any problems with the platform. However, like all software platforms, the platform is only as good as the after sales support. Thankfully, Discovertext has the best post-sales service of any company I have worked with, they are always accessible and you always get a real human at the end of the phone who knows the software inside and out where else do you regularly get to speak to the founder of the software and the CEO of the company on a regular basis for after sales help. Thus, to me, you can't go wrong with discovertext and I have no complaints. Overall: Made my research possible, cant overstate how important it has been for me! Discovertext is a great tool!It helps you make sense out of messy, unstructured data. Pros: It is easy to use. 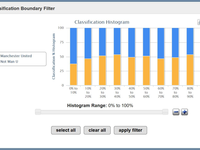 It is also fast in clustering and filtering data. I like the word cloud function which gives primary insights about your data. Cons: I found the advanced filters sometimes to be not accurate. Also, there should be an option of deleting data from a data set. It can get really difficult to create a sub data set without deleting function. Thanks for the review. It contains a really good suggestion whose time may have arrived. For a variety of reasons, we have never enabled the deleting of items. Instead, we typically use human coding and/or machine-learning to identify items that are not relevant, then we create new buckets and datasets of just the items we want to focus on. The advantage is that you retain all the data and can make the details of the cleaning process transparent to your audience. For example, we collected x Tweets, refined the set to x minus y Tweets, and so on. Also, this method scales up. As you refine the machine-learning relevance model (let's call it a "deletion" model), you can collect larger and larger sets and use machine classification to achieve the same effect as a much more time consuming manual deletion. Having said that, lots of people ask for a delete button and we will put it under consideration as a new feature. Pros: I use the software to do analysis of historical data from Twitter. The software provides various features to extract insights from Twitter metadata. Customised customer support. Cons: As with other online analytic software, you have to pay additional fee to use advance features. The standard features is good enough for analytics (using this for masters dissertation). Overall: Great software for those who want to gain insights from social media platforms. Good to hear that you are discovering insights from Twitter metadata. Fortunately there are ways to manage the cost, such as obtaining price estimates via Sifter or obtaining a representative sample (a certain percentage) of the data. Pros: I've been using DiscoverText to analyze lots of short texts (reviews on websites). DiscoverText is not restricted to social media: one can import data from text files or excel spreadsheets to run analyses. I was also able to teach the software how to categorize data using machine learning, with a pre-existing coding grid I had. This is kind of unusual, and I wouldn't have been able to do this without the *fantastic* help from people at DiscoverText. None of my questions was left unanswered, I have not yet bumped into software-related limitations, and the level of support I enjoyed from DiscoverText is hands down the best I ever had. Great preprocessing. The software is perfect to use. Pros: Export function is so nice. To write a research paper, I should perform my algorithm. That's why export function (excel format) is suitable to academic scholars. Basic statistics and graph are also nice because they give insights on the data. Cons: The software is great. However, Twitter pricing policy is barriers to scholars. Pricing on the volume of tweets is acceptable, but pricing of the period makes researcher hard. For example, the researcher needs to monitor at least 1 month. Then, daily pricing is so excessive although the volume of tweets is small. Therefore, the pricing policy will affect the popularity of the software. Overall: Preprocessing to perform my algorithm. Thanks for the review. The price to access Twitter data is based on a model Twitter developed. We have to use that model. You are describing the $25/day for historical Twitter access via Sifter (which is in fact a separate application). DiscoverText users are mostly not Sifter users, rather, they collect realtime data, or they upload their own data. Some DiscoverText users get their Twitter data access through Sifter, but that pricing is not a part of DiscoverText. DT has been my favorite tool for text coding and data collection for a long time. Pros: First, DT is incredibly user-friendly, especially for newbies even those who have never done any textual analysis before. I use DT myself and I trained several coders -- it's easy and straightforward and no confusion. Second, I've done coding using DT in foreign languages like Chinese and Spanish. Again, there's no difference in using the services with other languages. Third, it's convenient to compare coding results among coders and easy to export the files. Fourth, data collection via DT was pretty good as well. Cons: Depending on where you access DT, sometimes it gets a little bit slower. Also, make sure you export your data often, it won't keep it forever. Overall: I've done many research projects with this software. I chose Discover text to collect Tweets for internal research. Pros: It provides customers good quality of Tweets. The customer support is very good. it is possible tu use Paypal to buy data. Cons: It should be less complicated. The UI of the product should get improved. They don't provide any kind of contract when customers buy data but they just are able to send an invoice with the costs you have to afford. Any Sifter purchase includes 14 days of Enterprise DiscoverText access. This enables up to three users to collaborate on the dataset. If you spend more than $500, we will provide the software free for 30 days for up to five users. All purchases over $1500 come with 60 days of gratis access to the full suite of DiscoverText for up to 10 users. Pros: The features to manipulate and visualize data are very helpful. I especially like the sifter features like the cloud generator and the ability to display the most used single, biad, or triad terms. The meta data tools are also excellent! Overall: I have already recommended this to a classmate working on a similar project. This software has enabled me to gather historical twitter data from several months ago which is not possible with most other software. Hi Katie: Thanks for the review. We really appreciate the feedback. I see you might be in need of some customer support. We love to work one on one with customers via web meetings. They are fun and usually both sides learn great things. Pretty intuitive, lots of features. Pros: I really like that it offers access to FB text analysis as well as other SNS all in one platform. In addition, the analysis tool, similar to NVivo is nice to have in-house. At the same time, the exporting features can be quite helpful. The platfom is generally easy to navigate and clear. Cons: The great thing about CH is that they have awesome user support, their base is so big that you can ping the community for help, without needing to go directly through someone at CH. Obviously, this will grow out over time, but in the interim there could be more quick and easy resources and support. We appreciate the feedback. It is true that we remain a small startup, whereas there are bigger companies out there with huge budgets and massive user groups. Unlike some of the market research dashboards, we offer a set of text analytics tools for creating unique samples, collaborative annotation schemes, and unique data science measurements related to human and machine-learning. Generally speaking, we respond to emails the same day and I hope if you keep working with the platform that you will reach out to get any support you need. Pros: I think it's very well-priced compared to similar services offered by other companies. Especially because there is a very generous student discount, which makes the product much more accessible to researchers. The service itself is really useful, and I haven't come across any other too that has the same functionality and enables you to work on very specific data sets without extensive programming knowledge. The customer service is absolutely fantastic - very quick, friendly responses that contain very useful information. Go above and beyond the call. Cons: The documentation isn't as comprehensive or easily accessible as I would like it to be. It's more of an FAQ style, which is hard to navigate and doesn't always contain all the information I need. Would be really nice to have a link to one, single comprehensive document that contained all the information, in addition to FAQs and example videos. Overall: Without this software, I would not have been able to do my graduate research, as I don't have the necessary programming skills or data analysis skills to answer my research question using a programming language. Discovertext acts as a great in-between service, as it allows me to learn about data analysis and even a bit about programming but also offers me support. Great for analyzing social media data- just not offline documents. Pros: If you need to analyze data from social media and survey monkey- it's a great tool. You can search for content by keywords and the data drops in per the chosen frequency. It breaks down keywords and phrases to a list in order of use- where you can drill into each word or phrase to see where it's used and also toggle between different ways of displaying the results. Cons: I got the trial version to see if it would suit my purpose; I required a tool to analyze and cluster data from articles and other sources but just couldn't get it to work. If the trial period had been longer than 3 days ( I thought I signed up for 30- it's not very clear) I might have had time to figure it out. Better instructions would have helped. The instructions tell you what the features are, not why you need to use them which is not helpful for novice users. Sorry for the confusion about the length of the free trial. It was 30-days for many years and we changed it to 3 only recently. Please send a request to info@texifter.com and I will send you a 6-month license. So, I think you may not have fully tried to use all the customer support options. We work very hard to make sure newcomers get comfortable quickly. Great way to collect unique/interesting data; however, some technical background required. Pros: I think the greatest part about DiscoverText is all of the different types of social media data you're able to collect. I've only begun to scratch the surface of the usability of DiscoverText in my research. I also think it's wonderful that this software is "academic friendly" by offering discounted prices for faculty and students. Cons: If you've never conducted research with social media data, it can be daunting trying to figure out how to get going with the software. There are some "how to" videos to get you started (if you can find them), but I still found them to be above my technical understanding so I've had to pretty much stumble around to use the software correctly. Additionally, I contacted customer support with a question about one of the variables collected from tweets and never received a response. Thanks for the review and your business Kelley. I went through our email looking for a missed request for help and I am unable to locate one. If you still have a question, I would be happy to schedule a web demo or try to answer it via email. Please email info@texifter.com and we will do everything we can to make sure your project is a success. Pros: The software is easy to use and navigate. Access to Twitter and Facebook is useful, but I found the ability to capture RSS feeds to be especially unique to the research I do. Cons: The main problem I run into, especially with Twitter data, is the number of units I can store. Upgrading to the top tier account is cost prohibitive, so I am left to work within the parameters of the software. That means when capturing Twitter data I can easily reach the cap in an hour or two. I'm always on the lookout for a software that can allow me to capture more data affordably. You can keep your subscription at the Professional level (with the 50% discount for being faculty) and just upgrade the amount of storage. All professional accounts come with storage up to 10,000 units. You can purchase more storage units for $20 a month per 100,000 up to 1,000,000 units. If you need more than 1,000,000 units, contact us. Items imported via the Twitter Premium PowerTrack do not count against your general storage limit. We do need to meter usage of cloud computing resources. If you store and process more data, it costs us more money. Pros: The ability to create datasets / buckets is fairly useful, particularly when you work with thousands of records at the same time. Datasets are conveniently partitioned into 50,000 records, which is also very useful when downloading. Cons: It takes a few minutes to familiarize with the interface, but it's fairly intuitive afterwards. Overall: We were interested in having access to historical data from twitter, but DiscoverText allowed us to perform some cool analyses on the spot. Thanks! Yes, as you¿ve discovered, DiscoverText (https://discovertext.com/) users are mostly not Sifter users, rather, they collect real-time data, or they upload their own data. However, some DiscoverText users get their historical Twitter data access through Sifter (https://sifter.texifter.com/). Unlike some of the market research dashboards, we offer a set of text analytics tools for creating unique samples, collaborative annotation schemes, and unique data science measurements related to human and machine learning. Cons: Still learning to navigate the interface. Hoping that Twitter does not change its policies to limit access for DiscoverText and other apps. Overall: I have been using it with students to look at Twitter conversations regarding #immigration, along with several other projects. Discovertext has been a great tool for social media data collection and analysis. Pros: One of the best things about DiscoverText is that I can collect and analyze data in one place. In addition, I can begin collecting data immediately, which is beneficial for trying to capture consumer sentiment in the moment, as events unfold. Cons: Long-term data collection can be difficult, as I have not found a way to set up a (automated) data collection for longer than a year. Thanks for submitting your review. You are correct that the default limit is 100 fetches using the search API. We do this to avoid having lots of unmonitored feeds running perpetually creating massive datasets that we need to store in a commercial cloud. However, if you want to set up a perpetual Twitter fetch, the key is to use the Gnip PowerTrack. As long as you have credits ($7.50/10,000 Tweets), the fetch can run for a year or forever. Please send an email to info@texifter.com if you would like a deeper explanation or a demo. Thanks for the feedback and long term support for our efforts! Used DiscoverText for academic research, both for social media and newspaper text analysis. Pros: Best features are the easy, very user friendly function for importing and coding social media data, the machine learning function that allows for automated coding of large datasets in a reliable manner and the validating function that ensures intercoder reliability. Cons: The occasional bug shows up when running search or coding analysis functions but in the five years we've been using DT these instances have been rare and always promptly addressed by the DT team. Cons: Never heard back when I emailed concerning what happens to my data when I was finished with coding. It was rather expensive for a grad student trying to finish a PhD. Overall: It was a great way to code thousands of tweets. We really appreciate the review. Please check your email for a message from us. You excellent question will go in an updated FAQ. The program did what I needed it to. Pros: I liked that the filter function was easy to use. Coding was also easy, and that I could batch code items was a big plus. Cons: I wish I could also sort based on how I coded the items. I would like to go back to one code and take a look at just those items, and perhaps add another code to them. Overall: Easy coding of lots of data. 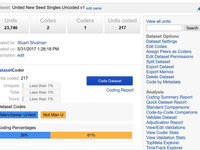 When you are on the Dataset Details page, just click on the bar graph of the coding results or load the Advanced Filters on the list view. Either way will get you to the set of items with that code. You can put them in a bucket for closer analysis. Another option is to do it via reports and a third option is through exports. Cons: It was way more full featured than I needed, so it was a little hard to navigate. Thank you for your review. Sifter is indeed a powerful tool, and therefore does take some time to learn all of its features. We try to make this easier with our training resources. I've been using DiscoverText since 2012 for research on Twitter. Pros: It can handle an enormous amount of data, you can automate the ingestion of feeds within certain dates and the frequency that you decide. You can generate tag clouds and timelines, look for the frequency of a term or any of the meta dat that a tweet has, etc. Cons: It could be more intuitive, just to say something I think they can easily improve, but it got a lot better in the last months. 1. The cheapest place to get your hands on Gnip data, I've compared 10 services and this is what I have chosen - 75% off for students, can't beat that. 2. The "Swiss Army Knife" of text analysis - it collects, captures, cluster, search Twitter, and have real people coding and conducting sentiment analysis, and conducts machine classifications all in one package. 3. Registering is easy with LinkedIn or Facebook! 4. Lots of trustworthy organizations and associations use DiscoverText, because their founders are not for-profit (they are but they aren't), their customer service is top-notch, very responsive to answering questions and helping me navigate the software. Cons: The interface is not so intuitive, it's not flashy, but it's like any academic-developed software, you have to look beyond the boring interface and discover the real powers of DiscoverText. Thank-you for the detailed and enthusiastic review. Good luck with the PhD. Pros: My master's thesis would not have been possible without DiscoverText! I was able to analyze hundreds of thousands of datum quickly and easily. It was great for data management as well; lots of good query/coding/organization features in here. Any time I ran into an issue, customer support was responsive and awesome. I especially like the integration capabilities with social media data. The interface itself is simple and fairly easy to grasp. Cons: Not a "con," but it would be cool to see the software incorporate more data visualization features and network-based metrics. Overall: See the "pros" list--I got my master's degree! We are one of the few services that handle non-English text analysis (including Arabic) on par with English ones. As you¿ve discovered, although ¿geo:¿ rules can be very useful for selecting specific data, they can also severely restrict the quantity of data you may receive. For example, the place, place_country, and has_geo rules could eliminate 99% of the tweets because geo data is extremely rare in Twitter. Also, geo data was not captured in the early years of Twitter and are a relatively recent feature. These are limitations of the Twitter source data and not of our service. If you find that the number of estimated activities is very low, consider removing a rule and reevaluating the results. Pros: The software was easy to navigate and efficient. Cons: There would be random times when it would randomly slow down or stop working altogether. We appreciate the feedback, Obehioye. Given the huge volume of data that some projects involve (for example, there are over 500,000,000 tweets created each and every day) there may be occasional pauses. If you think something has completely stopped working please contact us; if a support request is generated, you will hear a response the same day, often within 30 minutes. Efficient, easy to use and excellent customer service. Pros: My introduction to DiscoverText demonstrated how it is an incredibly efficient, user-friendly platform that allows a remote team of coders based around the globe to collaborate and analyze textual data imported from Twitter. That's obviously huge, but DiscoverText has a variety of other advantages that sets it apart, including the ability to upload any text with metadata in a spreadsheet, being able to measure the reliability of coders who work synchronously or asynchronously, being able to rank coders over time (very unique), a "CoderRank" patent that accelerates machine-learning, SurveyMonkey being integrated so you can get data over the API (there's also DiscoverText API), no programming is necessary (just point and click), and above all else, DiscoverText is a platform that offers all of the tools needed to collect, clean, and analyze text data. Pros: The ease of use when it comes to collecting the data. I could collect a very large amount of data in a very short time. Cons: The advanced search needs more variables. For example I tried to only collect data in English but it wouldn't let me do that even though I was told it was possible. Overall: It really helped me with my thesis. Had I not have this tool it would have taken me significantly longer to conduct the research. Thanks for taking the time to write a review. In fact, you can create language filters before and after collecting Twitter data and you sometimes need to do both to weed out misclassified data. First, you have to use the Gnip PowerTrack and not the Twitter search API. Language filters are one of the premium Gnip features. Second, even if you use the rule "lang:en" some of the data (maybe a few %) will still be in other languages. In DiscoverText, every account has access to a global classifier which will score every item on the likelihood it is English. Then you can filter out the remaining non-English items. Pros: Incredibly powerful - I could not have done my research project without it. It undoubtedly saved me hundreds of hours of time. The staff are lovely. Thanks very much for the review, Laurence. We love hearing success stories like yours. Let us know if there is anything we can do to help. Overall: I used DiscoverText for the first time around six months ago for a project, where we analyze historical Twitter data. In the beginning it was possible to schedule a web-training with DiscoverText, which was extremely helpful. For question that came up after the training, there were lots of videos and blogs that answered our questions. If we had any problems the DiscoverText team was extremely fast to reply to us and solving our issues. Thanks for a wonderful review Alexandra. We like working with teams like yours and hope we can continue to provide the support you need to succeed. This is a user-friendly software that allows researchers to easily code very large corpora. Pros: This is a user-friendly software that allows researchers to easily code very large corpora. Other datasets couldn't easily handle the data. Moreover, it is wonderful for e-rulemaking and public commentary. Cons: It takes a bit of getting used to if you are segmenting your data into "buckets." After a bit of experimenting we easily began using Textifer! Overall: I was able to analyze a very large data set. Pros: The ability to review, code, manage data with the rich online environment of Twitter allows for good mixed methods research: at the same time balancing quantitative aspects and looking in-depth for the unique or groups of messages with certain characteristics is very enriching for a researcher on Social Media -in my case, Twitter. Also, its connection with Twitter's Firehose allows for the direct import from Twitter to DiscoverText platform. I'm glad you are deriving value from our tools to analyze data from the Twitter Firehose. Thanks for your feedback on the interface. It would be a large undertaking to overhaul the front end. We would like to, but a bigger company tried in 2013, spent $1M, and then gave up, so for now we tinker at the edges to make the experience usable. Pros: Extremely and affordable partnership with GNIP for Twitter data. Useful quick quantitative analysis. Great support for collaborative content analysis.